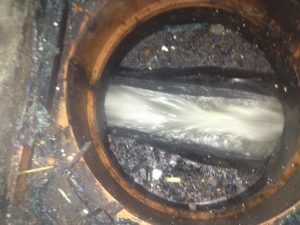 Do you have a drain cleaning Emergency? 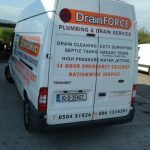 We are a drain cleaning company based in Tipperary and providing the drain cleaning services in Tipperary, Cork, Limerick, Clare, Waterford, Kilkenny, Carlow, Kildare, Offaly, Laois and Galway. We offer a one-hour service to Tipperary, Kilkenny, Limerick and Offaly. We serve domestic and commercial clients and our rates are reasonable and affordable. We use high-pressure water jets clear blockages in pipes and to remove debris and scale from the drain system. This water jet system is also very efficient in cleaning as it is at pressures up to 5000 psi. Fats, oils and grease, origination from vegetable oils, animal fats, meats and dairy products can create major blockages in drain and sewer systems. Drain Force empties grease traps and unblocks problems caused by these fats, oils and grease. The roots of trees invade drainage systems through the joints in the pipework, broken pipes or fractures, in order to access the water and nutrients in the pipework. The roots then fan out and grow in a large section of the drainage system. We track down these roots and eradicate them, before repairing the damage done to the pipework. We have many commercial clients around Ireland who have a maintenance contract with us to keep their drain systems trouble free. We also deal with domestic customers who have a problem or an emergency problem. We value both our commercial and domestic clients and no job is too big or too small. We provide effective environmental solutions to handle industrial projects safely, quickly and efficiently. We actively seek to understand our customer's requirements to provide successful industrial cleaning and waste management services. 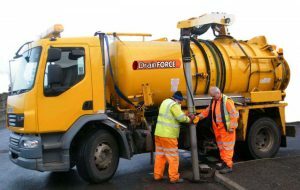 Gully suckers are a specialised tanker with suction gear that will take up wet waste, mud and sludge from spaces such as the hollows below drains in street gutters, carrying it to a suitable disposal point. Specific suction power is required to meet the needs of the job, as the material being removed can contain bulky debris such as tree branches, stones etc.